The latest installment of America’s favorite dino-romping franchise will likely prove to be the apex predator at the box office this weekend. Set four years after the prior installment in the blockbuster film series, Jurassic World: Fallen Kingdom takes us back to the original island — where Isla Nublar’s dormant volcano begins roaring to life. 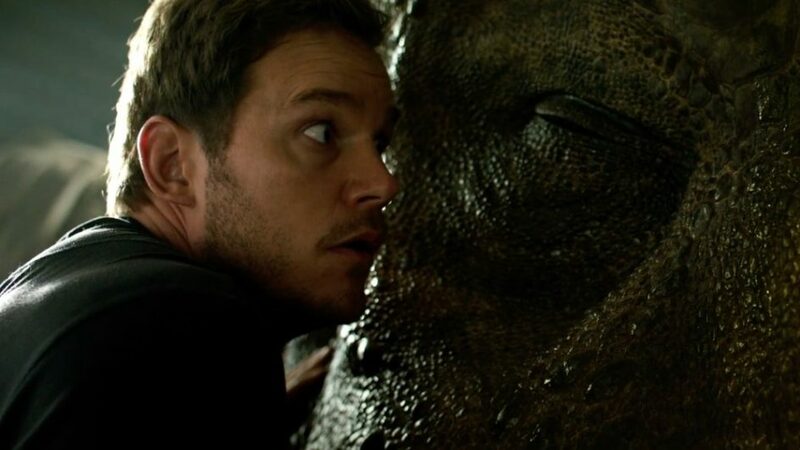 Plucky leading man Owen (Chris Pratt) and girl-power champion Claire (Bryce Dallas Howard) set out to rescue the dinosaurs from what a somewhat-expository media clip calls an extinction-level event. The park sits abandoned, while the dinosaurs fend for themselves in the jungles. Recruited by an intriguing new set of characters who seek to rescue and transplant several species to a sanctuary (which bears a humorous, perhaps easter-egg resemblance to Transformers‘ Dinobot Island). Claire convinces Owen (driven to find Blue, his lead raptor, who’s still missing in the wild), to join in the adventure, but their expedition turns out to be a lot more complex, and rife with baddies who have nothing but cold hard cash in mind and a plan to “weaponize” the critters (a la Dino-Riders?). Creative ties to the prior stories are introduced, with familiar emotional refrains that rally the nostalgia of fans. Pratt and Howard return alongside executive producers Steven Spielberg and Colin Trevorrow, and are joined by co-stars James Cromwell, Ted Levine, Justice Smith, Geraldine Chaplin, Daniella Pineda, Toby Jones, Rafe Spall and Isabella Sermon, while BD Wong and Jeff Goldblum reprise their roles. Directed by J.A. Bayona, written by Trevorrow and its co-writer, Derek Connolly, Fallen Kingdom also features the return of Michael Giacchino for an exciting musical score. The film is likely to be better-received than its previous installment, as it delivers on franchise-norms in many good ways. There are multiple nods to iconic imagery or shots from the original film and beyond. While it sports a handful of predictable beats, this story is much more “Jurassic Park” than some of the approaches taken in others of the series. There are a couple of weird editing choices, some very limited CG problems, and one noticeably jerky camera tilt in an aerial shot, but generally the film is technically well-executed. There is also a villain who serves as a stand-in for Trump, complete with very-Trump hair and an obsession with his riches. His stature is short and his overcompensation is very present — an ideally cynical parody. It is not a spoiler within the genre to say that he meets his end in a satisfying way, while also bringing joy to the fans in his status as a proxy for The Donald. On the more serious side, the film does give service to ethical notions about cloning and biotech, and introduces a twist of human connection to the legacy of John Hammond’s genetic manipulations. A major element of note is the “big bad” dino in this film. A vast — vast — improvement on Jurassic World‘s Indominus rex, the new “Indoraptor” is more believable, sleeker, less cumbersome, more interesting and better-designed. It represents some of the many ways this sequel seems to make adjustments to get back on track with the cadence of the franchise. Jurassic World: Fallen Kingdom weighs in at a solid 4/5, and should heat up cinemas right on time for the summer movie season.